Cedar Trail Summary, Architecture, Features. 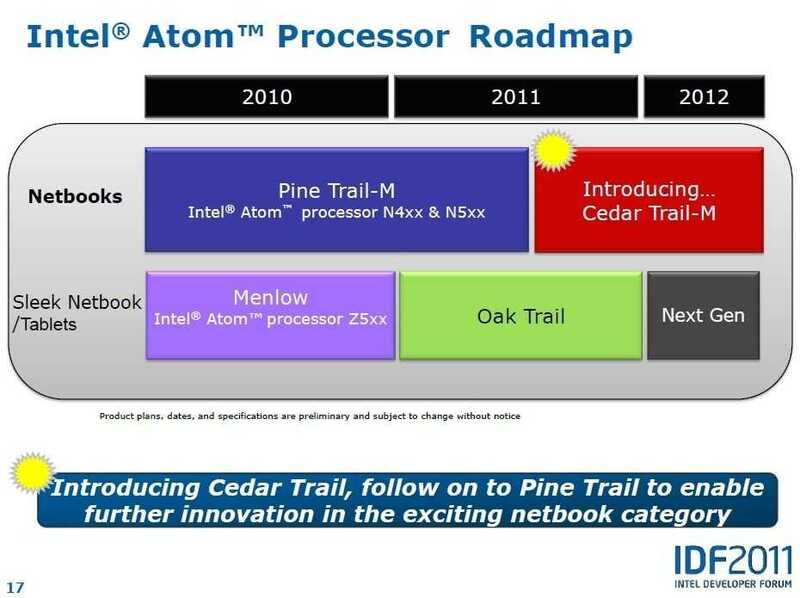 Technical sessions at Intel’s IDF in Beijing have all finished now so it’s time to go through some of the presentation material, the press releases and interview information from various sources to put together a summary of what Intel are planning with Cedar Trail in the netbook market. some details are still misssing but at this stage we can put together a fairly complete picture. 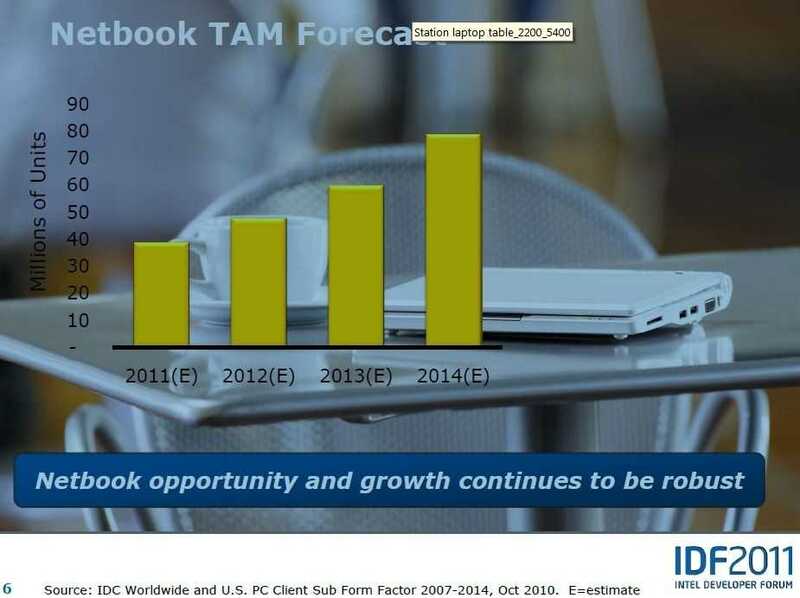 Intel’s netbook strategy comprises two platforms. The first, and the one that appears on most netbooks, is the Pinetrail platform. That is due for an update later this year and the new platform will be known as Cedar Trail, the one we’re discussing here. The second platform is a more specialist, low end [performance] platform that grew out of the Menlow ultra mobile PC platform. Oaktrail, which uses the Z6xx Lincroft cpu is shipping now and offers a lower TDP with refined graphics and enhanced power-saving features. Oaktrail is for embedded, tablet and thin, light and rugged netbook solutions. Information on Oaktrail can be found here. 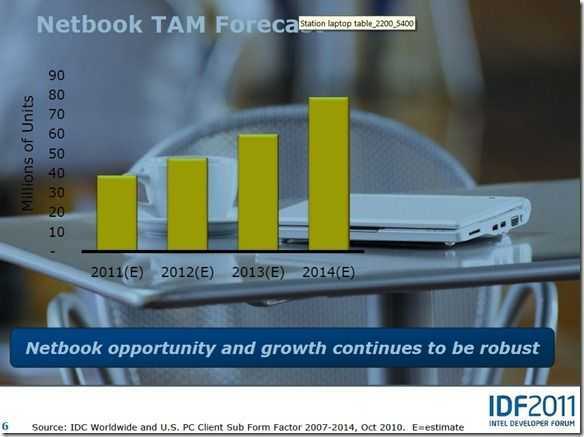 While excitement in the netbook sector has cooled off somewhat and most commentators agree that some parts of the market are seeing competition from tablets, the sales numbers remain significant. Note that this is the total addressable market. 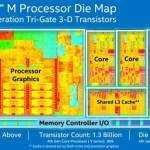 AMD Fusion, ARM and VIA-based devices will be competing for this market too. For Intel to compete it needs to address the top, bottom and specialist segments of the market. Thanks again for your coverage of all of this. Weâ€™ll be hearing about products that will use all of this technology for months to come, but sadly I bet that a lot of the people whoâ€™ll make comments and join conversations about those devices gloss over articles like these. Thatâ€™s too bad, especially because youâ€™ve made the topic clear and useful. One suggestion: Towards the end, you started getting into the software and driver support as you noted that some of the hardware features would currently need Windows 7 Home Premium before they could be realized. I hope Iâ€™m not alone in saying that Iâ€™d like to see these issues explored and covered more thoroughly in your write-ups. Theyâ€™re every bit as important. 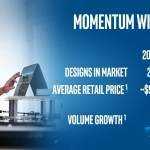 Like most hardware vendors, Intel employs software developers to build and maintain drivers as well as collaborate with those who develop operating systems. As youâ€™ve implied, every consumer needs to be educated about the extent to which a choice of operating system supports a choice of hardware. We need something better than just hope and assumptions to go on. Intelâ€™s time-line for releases and the support of specific features on specific operating systems varies wildly from very solid to very inconsistent. Your coverage here doesnâ€™t do much to clarify things in this case. Iâ€™d really appreciate some more words on this in the future. Dedicating a whole section of these articles to those issues would make your already great coverage even better. Itâ€™s perhaps also important to remember that the ability to worry about this is a luxury. For example, on most ARM platforms, the only assumption that is realistic is that the operating system with which your device ships is the one with which youâ€™ll be stuck. You might be allowed one or two upgrades, but you can abandon all hope of enjoying a variety of operating system choices or long-term upgrades or support. In contrast, Intel offerings like this open back up the possibility of consumer choice which makes the coverage of drivers and software that much more important. 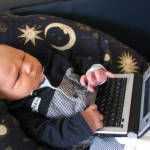 Isn’t the difference between netbooks and ‘sleek’ netbooks/slates becoming increasingly blurred? So I’m not sure where Cedar Trail comes in and if it really wouldn’t be useful in slates as well? How does Cedar trail compare to Oak trail? It’s a very good question. Essentially, cedar trail is the mass market platform with Oaktrail being a specialist embedded platform that is simply being marketed for the trend of the moment. It has some better energy saving components than Pinetrail at least. Pinetrail is.likely to appear in tablets too, just as Pinetrail did. All very confusing! Thanks Chippy. Too early to compare I guess but for now I assume CedarTrail should give better overall perf especially with higher 2.0 GHz CPU’s. On the other hand OakTrail should give better battery perf and better perf for some decicated graphics scenario’s (e.g. video playback)? Question if people who are looking for tablet/slates should wait for CedarTrail or not or will be just fine with OakTrail. Oaktrail with Meego or Intel Android could have some significant battery life advantages on Oaktrail. It also includes a 720p Encoder on Oaktrail. Cedar Trail will bring higher power but less battery life. It depends what you want. Lets see how the first Oaktrail devices perform first! I wanted to hear that Intel makes a 7-inch tablet can be switched to serve as a mobile monitor, not only a tablet PC function. I want a 7-inch multi-function device to be in a camera package, but not two type devices. The rumors are it will continue to use the NM10 Express Chipset like Pine Trail. Now you have 8.5W TDP N550/N570 and 6.5 TDP N475. That’s a platform power consumption of 10W and 8W respectively. 3.5W TDP for dual core resulting from that calculation fits with rumors saying certain versions of Cedarview chips will have 3.5W TDP. Yup. Sorry I got confused with the 0.75w tdp of the Oaktrail controller. The overall 4w figure is still very close though. Oaktrail does include the ‘power grating’ feature that would allow it to idle down into always-on states. Meego and Android can take advantage of this. ARM based Tablets and Smartphones have a special chip that integrates power management around the CPU(like VR) and the platform itself. Pre-Oak Trail devices were just like the PC that it was off chip and all around the mainboard, which meant slower reaction time resulting in greater power consumption. The special chip, called the PMIC(Power Management IC, simple eh ;) ), also interacts with the operating system to control everything else. So in Pre-Oak Trail devices, it didn’t matter if you had Windows, Android, or MeeGo. It was just like a PC that it didn’t have ultra low power idle state. Oak Trail(not sure about Cedar Trail, but definitely on Medfield) has the PMIC that will finally allow optimized OSes like Android and MeeGo to go into that low power state. Thanks Davidc1. And to elaborate on that and pull it together, an advanced feature of this pmic is that it can control low power states and even turn parts of the die on and off when not required. That’s the power gating I was referring to. At least that is my understanding. I don’t think power gating works without the pmic and therefore without operating systems that are optimized to use the pmic. my only real question is about the GPU, is the additional power “real” or “circumstantial”? what I mean by this is, is it “real” like ION that will play almost any format at HD quality or is it “circumstantial” like the broadcom crystal chips that only played certain formats in certain players under certain conditions? big difference between true power & tricky power. That entirely depends on whether the video codec supports the hardware. You see, CPUs are fully programmable devices so you can get any code to run it without having to optimize for it. HD playback on a GPU needs fixed function circuitry which has to be optimized on a per hardware basis. So given enough developer support, ANY fixed function hardware, even the broadcom decoder can run it fine. I think they finally got flash playback with the 10.2 versions and latest graphics drivers on the GMA 500, but it should really be improved with the GMA 600 on Oak Trail. What about Cedar Trail? If its a derivative of the HD Graphics then you can expect good support on it. Do you know when the new viliv x70 with oak trail CPU hits the stores? I was expecting it around mid-April but haven’t heard anything yet. Any idea? I wonder about that too. I know there has been delays (because of Intel?) and first Oaktrail tablets would be available May. Potentially Fujitsu Q550 being first since that was one of the few with a release date (April/May). 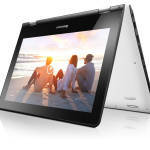 Since there has been about no news on any of these tablets (Lenovo/Viliv/Fujitsu) I wonder if actual delays are longer. Perhaps June/July? I’m sure the earliest will now be Mid-may. End of May earliest. We May have sample in first weeks of May. Fingers crossed.